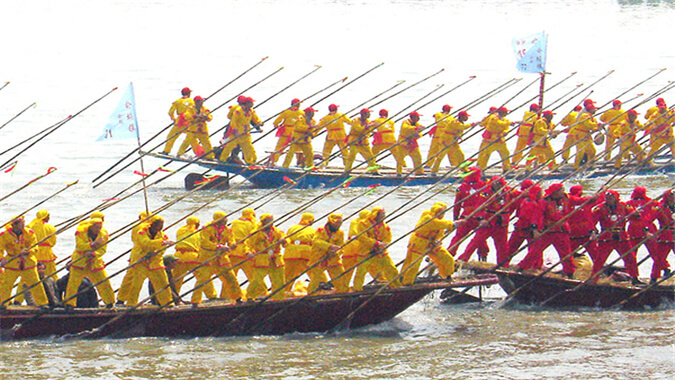 Qintong Boat Festival is an ancient Chinese folk activities. Qintong Boat Festival is an ancient Chinese folk activities. Qintong boat is mainly distributed in the Lixiahe region, and hundreds of square kilometers. Boats are usually divided into Penny’s boat, boating, Huachuan, tribute ship, turn boat woman etc. five types, ignited a Han people’s best wishes and hope and pray, and look forward to peace and prosperity, prosperous life, long Shichang, “. Qintong Boat Festival is an annual, “Qintong boat under heaven”, known as the “Grand View of folk culture, the region of rivers and lakes customs Expo”.